U.S. children are being used as guinea pigs. Your children are the experiment! (NaturalNews) As ridiculous as it seems, retailers across the U.S. are already stocking their stores with Christmas goods. It’s all about the big commercial push, of course, since retailers make about 50 percent of their profits during the Christmas season. Similarly, flu vaccine manufacturers generate huge profits during the Christmas season, too, and they’ve already begun shipping this year’s winter season flu vaccines to U.S. pharmacies and hospitals. Never mind the fact that the actual flu strain in the vaccine is little more than a hodgepodge collection of last year’s flu strains. Each year’s flu vaccines are technically only applicable to last year’s flu season, making them perfect for time travelers but useless for everybody else. Along with the big vaccine push comes the inevitable vaccine propaganda. It’s all so predictable: First there’s the announcement that “everybody should get vaccinated.” This is followed by some later announcement in the pre-Christmas season of “how bad” this year’s flu season is getting. This is followed yet again by another urgent bulletin by health authorities urging everyone to get vaccinated. The big vaccine push only quiets down when vaccine supplies dwindle. But as long as vaccines remain in inventory, the big vaccine push will stay aggressive, and during this annual charade, there won’t be a word mentioned about vitamin D and how it is far more effective than any vaccine at protecting people from seasonal flu. Now hold on a second. If you read between the lines here, this statement implies that: 1) Vaccines cause seizures in children. And then 2) This particular vaccines causes a higher rate of seizures in children than the usual rate of seizures in children. Why is this curious? First off, because vaccine pushers have always sworn their vaccines caused no seizures whatsoever. No neurological problems. No spontaneous abortions in pregnant women. No increased rates of autism. Vaccines are all perfectly safe, they say, and no children are ever harmed by them. That’s the mythology, at least, behind vaccines. But the reality is far different: Vaccines do cause seizures in children, and this year’s vaccines look like they’re going to cause a significantly higher rate of seizures than usual. Yep, everyone. That means one-month old infants. Pregnant women. Children with seizure disorders. Immune suppressed seniors. Everyone! You see, in years past, vaccines were never recommended for everyone due to well-founded safety concerns. In some people, you see, the nearly-dead viral strains used in vaccines can actually cause the very flu they claim to prevent. So the CDC has, for as long as anyone can remember, always warned certain groups to be excluded from vaccines for their own safety. Well not anymore. Any safety concerns have been thrown out the window in the quest to push more vaccines onto more people. Billions of dollars in pharmaceutical profits are at stake here, and health officials can’t afford to let a little safety get in the way. Think about it: Why does the flu circulate in the winter months in North America, but the summer months (June – August) in Australia? It’s because those are the times of weaker sunlight exposure resulting in widespread vitamin D deficiencies. The flu is always around, living amongst us, just waiting for weakened immune systems so it can strike. To say that “the flu” kills people in the winter is factually wrong. It’s the vitamin D deficiency that kills people by giving the flu an opportunity to attack a weakened immune system. Where are the clinical trials? Read between the lines on this one: This Afluria vaccine causes an increased risk of seizures, it’s being imported into the USA to be injected in children this flu season, and the FDA is just now asking for a study? That means, of course, that no study has been conducted on this vaccine yet. In other words, this vaccine which causes seizures in children has never actually been properly tested in children according to FDA guidelines, so the FDA wants a test to be done but the vaccine will be injected into children in the USA anyway, even before the testing is likely to be completed. And that means, of course, that U.S. children are being used as guinea pigs to see what happens to them following this vaccine injection. If enough children have seizures or end up paralyzed or dead, the FDA will probably pull the vaccine off the market. But that only happens after the fact and after the damage has already been done. Don’t you get it? Your children are the experiment! 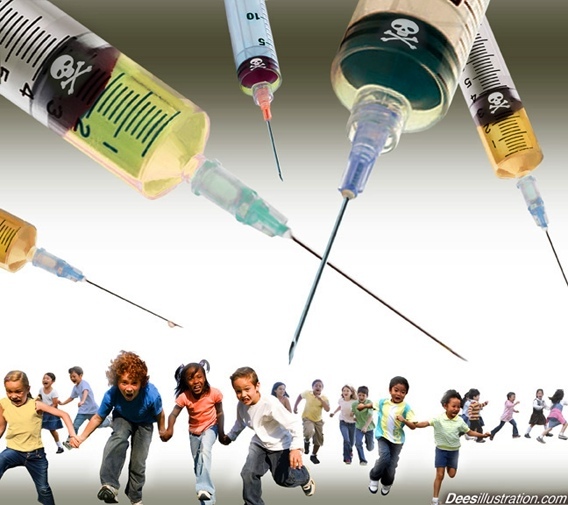 The American People are the guinea pigs for every vaccine these companies come up with, and it doesn’t matter if the vaccine causes seizures, brain damage or even death… American children are going to be injected by the millions in order to find out what happens. This whole annual charade is utterly useless to begin with. There is simply no medically justifiable need to inject anyone with a flu vaccine — ever! What people need is vitamin D to activate their immune response so that natural exposures to seasonal flu are easily handled by their existing immune system functionality. When vitamin D levels are high, the immune system responds rapidly to any influenza threat. That’s why I never get a flu shot and even so, I haven’t been sick for years. I do, however, get sunshine on a regular basis, and when I can’t get sunshine, I take a quality vitamin D3 supplement. And guess what? I don’t need a flu vaccine at all. I can walk into a room full of sick people infected with influenza and be completely and utterly immune to their coughing, sneezing, nose wiping and finger-licking handshaking. Having vitamin D in your body is like wearing a bulletproof vest for influenza. The medical industry won’t tell you this because there’s huge profit to be made in scaring people into paying for flu shots they don’t need. If people were told the truth about the dangers and the ineffectiveness of flu shots, very few would buy them. Because the truth is that, even in best-case scenarios, flu shots are maybe effective at preventing infections in one percent of those who take them. And that means ninety-nine percent of those receiving flu shots are wasting their time and their money. Plus, they’re exposing themselves to chemicals that are obviously dangerous to the human body or else they wouldn’t cause seizures in children, get it? And yet every flu season, people line up by the millions to get injected with something that might harm them, and they actually pay for being potentially harmed! Why do people do this? Because they foolishly trust in health authorities who almost universally have financial ties to the vaccine manufacturing companies and so are pushing a particular agenda in order to profit from vaccine sales. But scientifically speaking, the flu season could be stopped in its tracks by handing out vitamin D3 supplements instead of vaccine injections. No needles. No seizures. And no drug company profits. I don’t know about you, but I’d rather swallow a vitamin than get jabbed with a sharp needle. But that’s just me. Most other people, it seems, would rather spend their winters wiping their noses raw with Kleenex, drowning themselves in over-the-counter flu medicines and missing a week or two of work while they try to fight off a flu infection they could have prevented with a few vitamin D supplements in the first place. Believe me, it’s a lot more fun to laugh off the flu season and spend your winters healthy, well rested and completely immune to seasonal flu. Wanna join me in a healthy winter this year? Just boost your vitamin D levels and you too can laugh off seasonal flu and all the sheeple lining up to get injected like cattle in a branding line.